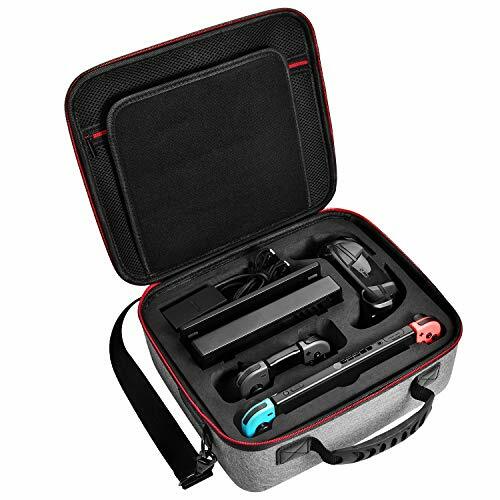 Diocall Deluxe Case for Nintendo Switch System, Secure for Carrying and Travel. Totally Fit Switch Console, joy-con with grip, dock, AC adapter, pro controller, joy-con straps, 21 game cards,HDMI cable and other accessories. This case is made of premium EVA material, makes it strong and safe when bring switch set. Featured by a middle board with the shock-resistance dots, it can provide a double protection for your switch. Hard EVA shell material protect your device from daily knock and bump, and the soft inner material keeps your device free from water and scratch. Coming with an adjustable and comfortable shoulder strap. It is very easy to carry on the go. Besides, you can also keep it at home when you are playing for daily use. If any question, please post on Q&A, we are glad to get it across to you. 【Upgraded Version】Specially design to fit for complete Nintendo Switch System. You can put switch console, dock, power adapter, joy-con with grip, extra pro controller, straps, HDMI cable and 21 game cards in it. 【Perfect Protection】Exterior: Made of hard EVA material, protect your switch and accessories from impact and shocking. Interior: Accurate EVA foam slots against scratches and make all stuff secure. 【Compact Design】Exact size ensure enough space for all parts, and the mesh pouch can hold more small accessories, such as usb cable and a phone. Keep switch set well organized and full use of space. 【Travel Friendly】Comes with a sturdy handle strap. Portable & Comfortable for carrying your switch system when going on a vacation. Everything is easy to put in and take out. 【NO RISK PURCHASE】We offer 100% money back or replacement guarantee if there is any quality problem. If you have any questions about this product by Diocall, contact us by completing and submitting the form below. If you are looking for a specif part number, please include it with your message.